One handed operation. 150mm jaw opening capacity. Soft non marking plastic jaws. 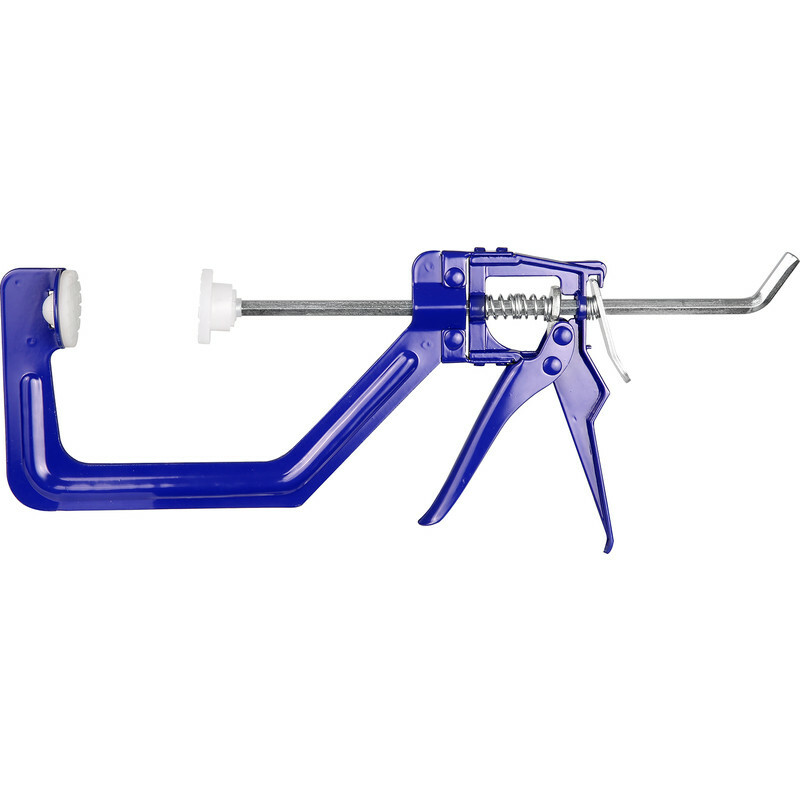 One Handed Quick Clamp 150mm is rated 2.6 out of 5 by 13. Rated 3 out of 5 by Waterboy from Good DIY tool A bit lightweight compared to other brands. They might not last under heavy trade usage. Rated 5 out of 5 by bob ilkw from clamp These are brilliant this is the second one I have bought they give you a third hand when you need one. Rated 4 out of 5 by none1200 from steel lever doesnt break like plastic ones have bought other one handed clamps their levers have been plastic & have snapped when applying pressure. this is metal & doesn't. the release is easily operated using a light mallet. Rated 5 out of 5 by Cheesy from Reasonably priced I use quick clamps on and off but when I need them I need quite a few at once. The locking/releasing mechanism is a bit crude so the action can be a bit stiff but it is an effective system. This design is much better for me than the ones with fancy handles and some kind of plastic tooth system for the locking. I've broken enough of that type to revert quickly to these simpler, more robust ones. Rated 1 out of 5 by Charles R from Weak clamp, OK for non-critical jobs Bought a pair and one broke on first use with relatively little force applied. I have been refunded by Toolstation, though they were slow to respond (could have been fall-out from WannaCry ransonware). These clamps are really only capable of applying quite a light clamping force, particularly as they are a bit "floppy" so the two clamping pads don't align that well and easily distort. Not recommended for anything vaguely serious - pay the extra and get better ones - I have now! Rated 1 out of 5 by Long from Rubish Clamps don't pull up straight and one broke the second time it was used!